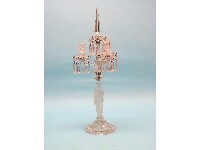 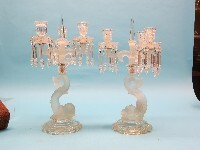 A late Victorian pressed glass candelabrum, three sconces issuing from figural stem, pendant lustre drops, domed circular base, 24in. 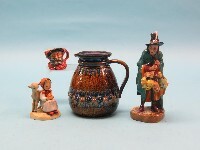 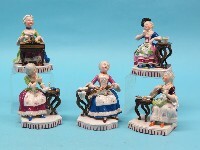 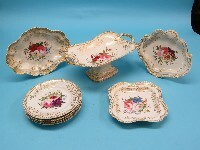 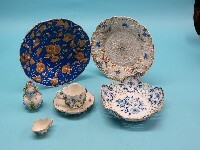 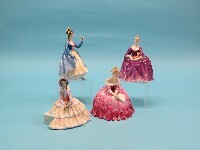 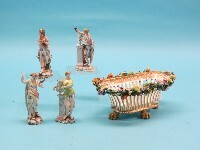 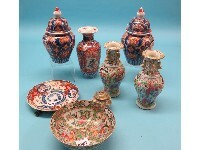 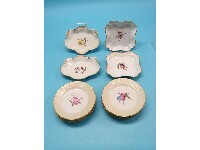 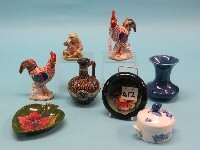 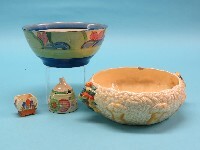 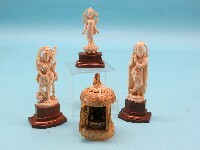 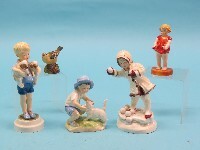 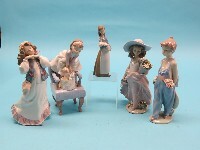 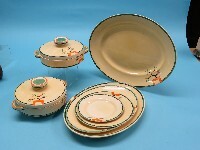 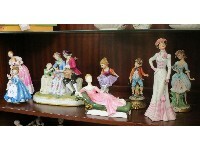 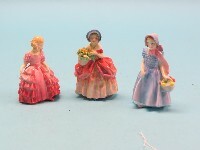 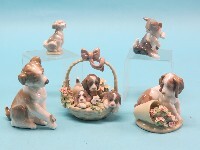 A set of four Volkstedt porcelain figures, The Arts, female figures, printed marks, 5.5in., and an oval porcelain basket, encrusted with bright flowers, 10in. 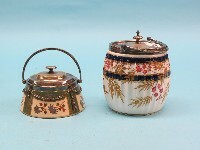 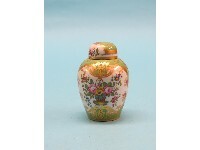 A 19th century continental 'Rockingham' jar, brightly painted with flowers against a gilded green ground, with cover, printed mock-Rockingham mark, 4.75in. 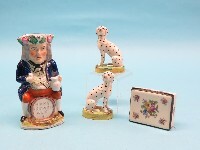 A Staffordshire Toby jug, seated gentleman with yellow breeches, 11in. 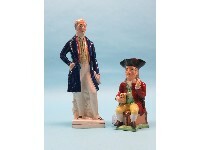 and a Victorian Staffordshire pottery figure of a gentleman, blue jacket, 17.5in. 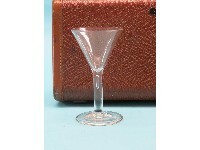 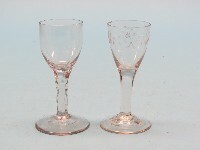 A George II wine glass, two-piece construction with funnel bowl, cylindrical stem with air tear, conical folded foot, 6in. 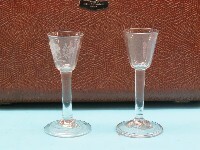 Two George III cordial glasses, one bowl cut and engraved, the other clear with faceted stem, circa 1770, 5in. 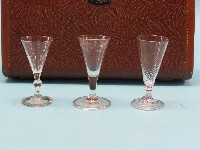 Three 18th/19th century glass ale flutes, each bowl engraved with hops, tallest 6in. 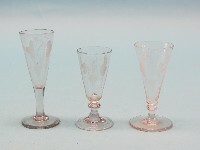 Three George III cordial glasses, one half-wrythen, another engraved, both with folded feet, the other with knopped stem, tallest 4.75in. 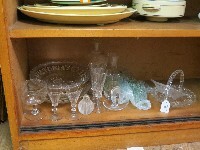 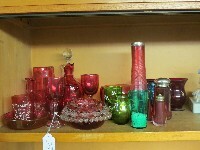 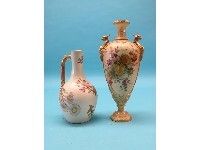 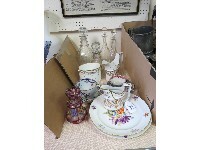 A 19th century engraved glass rummer, "pinched" glass decanter, Victorian royal commemorative pressed glass dishes, etc. 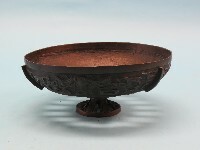 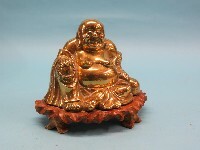 A Chinese bronze pedestal bowl, with cast script and key-pattern borders, 11in. 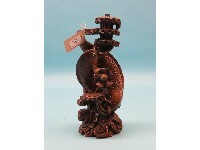 An Oriental wood-carving, entwined fish and underwater vegetation 12in. 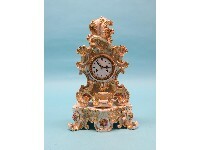 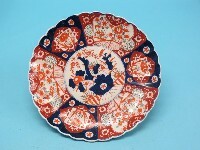 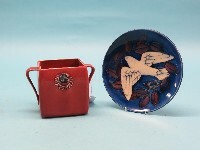 An Imari wall plate, floral-painted in traditional colourse, 14.5in., and another, 16in. 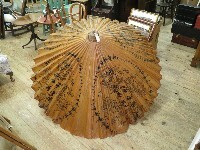 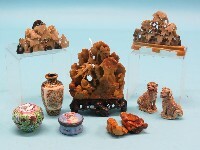 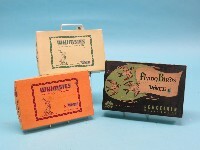 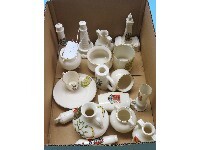 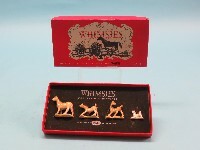 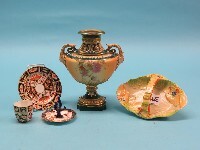 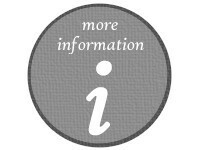 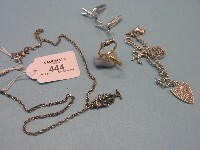 A quantity of costume jewellery, snakeskin cigarette case, Concorde luggage label, etc.